DULUTH, GA – February 2017 — Viscom today announced that it awarded Horizon Sales ‘2016 Representative of the Year’. 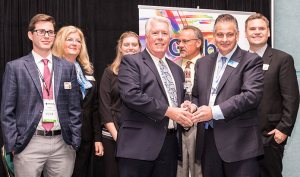 Carsten Salewski, President and CEO of Viscom Inc., and Ed Moll, Viscom Inc.’s VP of Sales – Americas’, presented the award to Dave Trail, President of Horizon Sales, during the recent IPC APEX EXPO in San Diego. Horizon Sales was selected for the award in recognition of the company’s sales performance in 2016. Trail and the team at Horizon Sales manage and sell Viscom’s full product line to the mid-western states of Michigan, Ohio and Western Pennsylvania, and recently added Illinois and Wisconsin. In business for more than 25 years, Horizon has supplied equipment and supplies to some of the most well-known names in the industry including Viscom.